Rent-A-Center is a national company offering furniture, appliance, computer and electronic rentals with rent-to-buy options across the country. With over 3,000 stores in 50 states across the USA, Canada and Puerto Rico, millions of customers rely on the brand-name products and services Rent-A-Center provides. In 2011, Rent-A-Center undertook an initiative to streamline reporting processes, delivering summarized daily sales data and detailed hierarchical reports to all levels of management nationally. They selected InfoSol’s InfoBurst business intelligence report and dashboard distribution and publishing solution to create a completely automated, efficient solution. On a daily basis, over 3,000 store managers nationally were logging in to BusinessObjects InfoView to run reports summarizing sales data for their store. Additionally, District Managers, Regional Managers and District VPs were logging in to the system to run more detailed reports showing complex hierarchical sales statistics. The high number of users logging in, often simultaneously, created a workload of over 4,000 reports on a daily basis, leading to inconsistent system performance and delays in delivery. Rent-A-Center needed an intuitive solution that would allow easy comparisons and pattern analysis. One of the unique challenges that Rent-A-Center wanted to address with the new model was managing security for the 3,000+ users. Additionally, they wanted to alleviate the frustration managers experienced during the several hours it often took to create a Web Intelligence report using BusinessObjects. Rent-A-Center’s solution was to replace the “pull” model in which users ran their own reports with a more efficient, automated “push” model. Using this solution, a single store report could be refreshed once, split by store and delivered to thousands of store managers with no manual effort required on the part of the recipient. InfoBurst was used to automatically schedule the reports, burst them by store, and deliver them by email to each store manager who would only receive the content relevant for their store. One of the most significant benefits to Rent-A-Center was that a single store report that previously took several hours to compile now took less than 20 minutes to run automatically and burst out to managers. An obvious benefit for managers was that the manual process and frustration of logging in to Business Objects on a daily basis and running several different reports was alleviated. Managers now received the same information automatically, in one burst. The initial solution was so successful that RAC was inspired to action! They went on to intuitively build more complex report bursting scenarios and design their own dashboards using InfoBurst to burst the content and distribute them. Rent-A-Center used the same concept of bursting single reports and applied it to Xcelsius dashboards to provide managers with interactive data, allowing visual comparisons of data between stores. 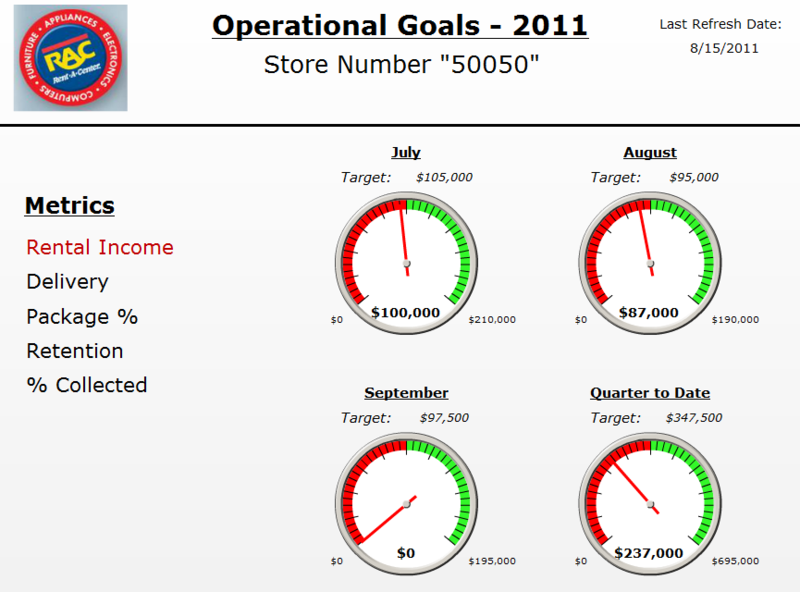 Managers received a daily personalized offline dashboard that included rolled up sibling store data and allowed comparison by District and Region. 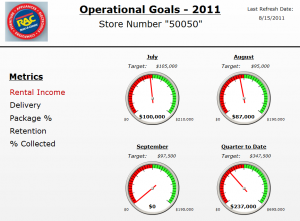 The offline dashboard eliminated the challenges of managing store connectivity and security, as well as any risks associated with connecting remotely and downloading the data. Additionally, senior managers received a dashboard that allowed easy comparison of metrics against previous years.